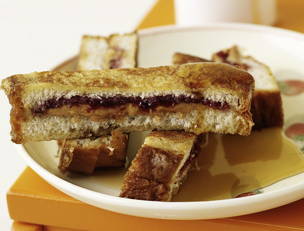 Spread the peanut butter on four slices of bread and the jelly on the other four slices of bread to make four sammies. Scramble the eggs, milk and vanilla in a bowl to make the French toast batter. Place a large nonstick skillet over medium heat, then add half of the butter. When the butter is almost melted, dunk two of the sammies into the batter and let the excess drip off. Place in the pan and cook until golden brown on each side, about 3-4 minutes per side. Repeat with the remaining two sammies if they do not all fit in the pan the first time. Cut into sticks and serve with warm maple syrup. In Recipes-list.com we have selected the most viewed recipes from category - uncategorized . Enjoy the best recipes specially selected for you! Peanut Butter and Jelly French Toast Sticks is the right choice that will satisfy all your claims.